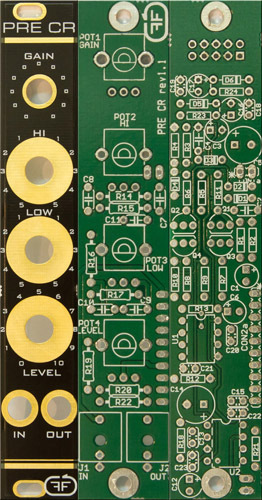 UPDATE : PRE CR is back in stock with rev 1.2Pcb. Nothing is changed in terms of sound, just updated the pot prints and rerureted the paths in such a way you don't need to cut the pots ear holders anymore. A PRE CR Kit 3 please! PM'ing you now. So do I understand correctly: this is the channel strips, there is no mixing involved? 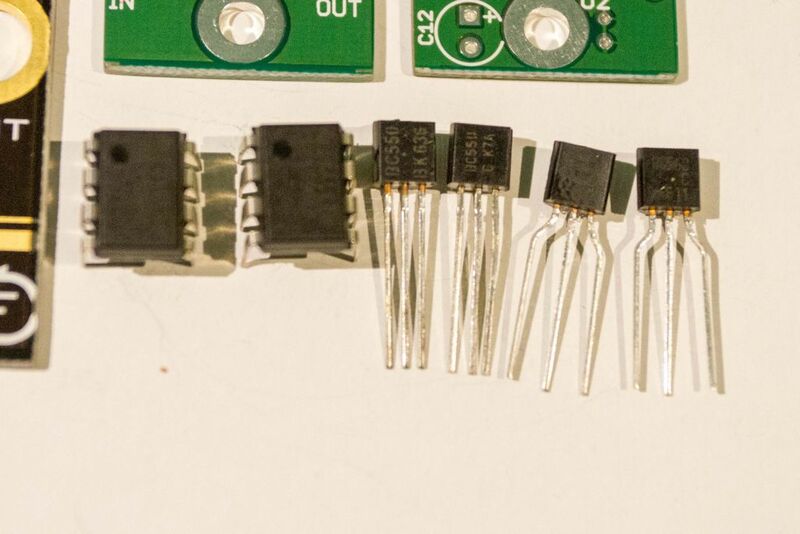 Is it an option to include a header on the back (for example from the switching connector of the output jack) to connect 2-3 of them to a mixer? And would it be possible to use these to boost line level to modular? Maybe with a tweak in component values? Yes. There is no mixer involved. And yes you can raise up the volume of your modular, they have a lot of gain, and a generous output. This PRE series are not only for mixing, but for sound sculpting. Like I wrote in the main post, many of the thechno and electronica sounds were made with this type of mixer lines. This will be an upcoming module, a stereo mixer with additional sockets on the back of module where you can connect any PRE you want. To connect them to a mixer is good idea (so I can also connect multiple PRE if I want?). And how much gain do they have, I guess to amplify line signals, approx 20dB is needed (10x). And one question: I assume the value of the antilog pot cannot be changed easily, like to 5kc. Thonk has these wityh a white indicator line, looks better than the usual plastic alpha. 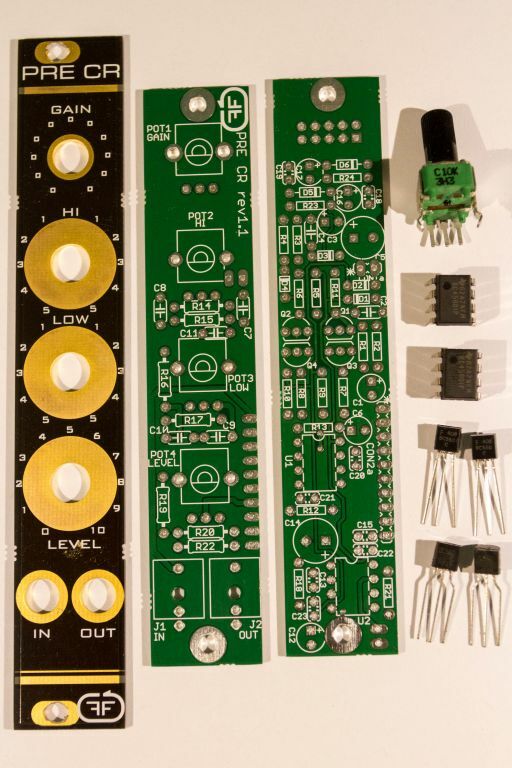 - Yes you can connect multiple PRE modules you want to a summing mixer. - You can raise a standard laptop, mp3, keyboard output of 1V PP to almost 20v PP without distortion. This is with gain at a quarter and level at maximum. - Original mixer have 5KC for gain, alpha doesn't have that values so we used 10KC. Both value works well. If these are still available, I'm interested in 2 sets of KIT 2 plz. 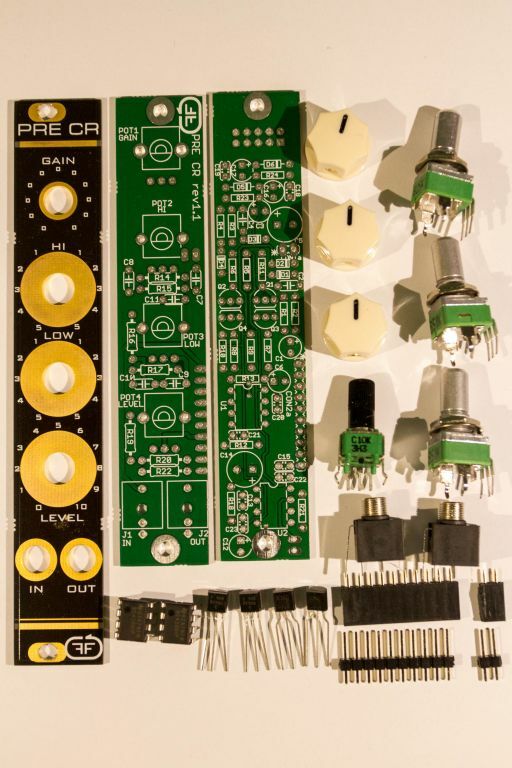 UPDATE : PRE CR is updated to rev 1.1 boards, now available. Read the main post for complete details. I built a Pre-CR and absolutely love it. It is really amazing for distorting kick drums, or basically anything involving drums. UPDATE : I corrected a mistake in manual. The 50KB pots and 25KB pot were filled with the wrong color. These look like some great projects. Hey: How important is it to match transisor-pairs in this day and age? I've found that tolerances are usually quite close in trannies if you get a reel of them. What are some of the symptoms of not so well-matched transistors? Cool! So... Yamaha, Yamaha and what... peavey? a regular multimeter. Your wave symmetry will not be good if there is a big hfe difference between the transistors. UPDATE : I corrected the building manual for some typos. 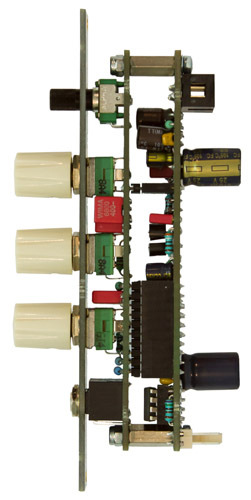 Just finished building this and it was working perfectly for about an hour when all of a sudden the 10 ohm R24 resistor burned out. Replaced it thinking it was a bad component but same thing happened again instantly on power up. My soldering looks ok but I'm fairly new to this and haven't a clue where to go from here. Anyone got any ideas of what I could do to find out what is causing R24 to burn out? The 10r resistors by the power connector are usually the 1st thing to blow if you reverse power the module but it shouldn't have worked at all if you did that. Replace it and check for shorts between +V -V and GND on the power connector, Check the orientation of the diodes D5 , D6 and that they aren't blown. Also check the orientation of C16 & C17. After that pull out the 2 opamps and power it up and test the points on page 10 in the build manual. If you cant figure it out post some pics. I attached a pdf file in the main post with output readings of each PRE type using a 1Vpp source at input. [UPDATE] Updated with rev1.3 manual. [UPDATE] : PRE CR is back in stock with rev 1.2Pcb.